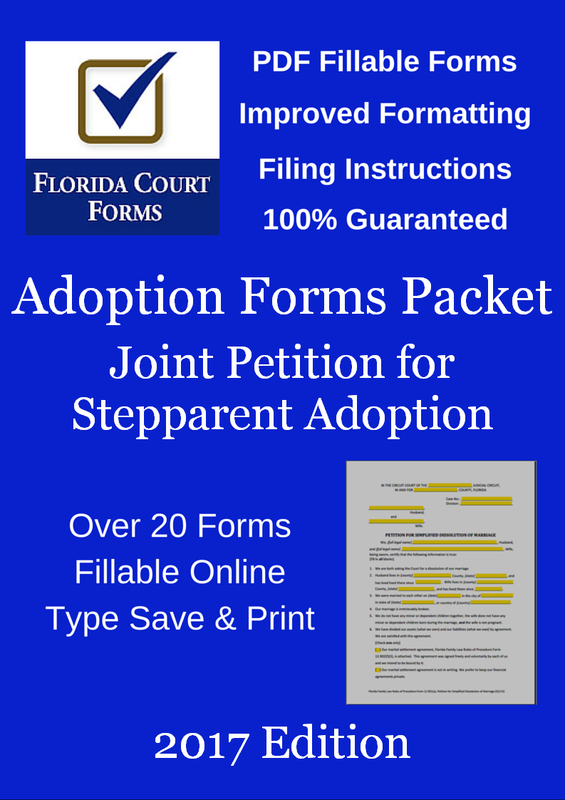 Florida Court Forms' premium stepparent adoption forms packet, FP981B1, includes all the forms in PDF fillable format and step by step filing instructions to complete the Joint Petition of Adoption by Stepparent from start to finish. 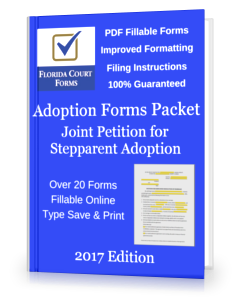 With our adoption forms packet, you'll have all the forms you need in fillable PDF format, and the do it yourself instructions to successfully complete a stepparent adoption in Florida. So, What's Included in Our Premium Forms Packet? Over 20 PDF fillable forms, required and procedural forms. Procedure for missing or unknown parent. Included are checklists on which forms to fill out and step by step instructions on how and where to file and the typical process for a stepparent adoption available in every county. And we will send you any form you may require that is not included (subject to availability). So why not try us out. You have nothing to lose and so much to gain.